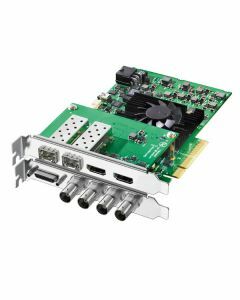 PCIe capture and playback 12G-SDI in SD, HD, Ultra HD and 4K DCI up to 4096 x 2160 60p in 10-bit YUV or 12-bit RGB. SDI Video Input: 2 x 12Gb/s SD/HD/2K/4K. Supports single link and dual link 4:2:2/4:4:4:4 and 2D/3D switchable. SDI Video Output: 2 x 12Gb/s SD/HD/2K/4K. Supports single link and dual link 4:2:2/4:4:4:4 and 2D/3D switchable. Analog Video Input: 1 x Component YUV on 3 BNCs switchable to S-Video and Composite. Component supports HD and SD. Analog Video Output: 1 x Component YUV on 3 BNCs switchable to S-Video and Composite. Component supports HD and SD. Analog Audio Input: 2 Channels of professional balanced analog audio via XLR connectors. AES/EBU Audio Input: 2 Channels unbalanced with sample rate converter. AES/EBU Audio Output: 2 Channels unbalanced. HDMI Video Input: HDMI type A connector with support for Ultra HD. HDMI Video Output: HDMI type A connector with support for Ultra HD 4K 60p in 4:2:0. HDMI Audio Input: 8 Channels embedded in SD, HD and Ultra HD 4K. HDMI Audio Output: 8 Channels embedded in SD, HD and Ultra HD 4K. Sync Input: Blackburst in SD, 720p50, 720p59.94, 1080i50 and 1080i59.94 formats or Tri-Sync in any HD format. Device Control: Sony compatible RS422 deck control ports. Serial ports TxRx direction reversible under software control. Computer Interface: PCI Express 8 lane Gen 2, compatible with 8 and 16 lane PCIe with HDMI mezzanine card. Supports: AVC-Intra, AVCHD, Canon XF MPEG2, Digital SLR, DV-NTSC, DV-PAL, DVCPRO50, DVCPROHD, DPX, HDV, XDCAM EX, XDCAM HD, XDCAM HD422, Apple ProRes 4444, Apple ProRes 422 (HQ), Apple ProRes 422, Apple ProRes (LT), Apple ProRes 422 (Proxy), Uncompressed 8-bit 4:2:2, Uncompressed 10-bit 4:2:2, Uncompressed 10-bit 4:4:4, Uncompressed 12-bit 4:4:4. Media Express, Disk Speed Test, LiveKey, Blackmagic System Preferences and Blackmagic driver on Mac OS X. Media Express, Disk Speed Test, LiveKey, Blackmagic Control Panel and Blackmagic driver on Windows 7 and Windows 8. Media Express, Blackmagic Control Panel and Blackmagic driver on Linux. PCI Express 8 lane generation 2, compatible with 8 and 16 lane PCI Express slots on Mac OS X, Windows and Linux. Mac OS X systems require a Mac Pro computer with PCI Express slots. Please check the Support pages to see the full system requirements. Nuke, Steinberg Nuendo, Avid Symphony, Avid News Cutter, Tools On Air just:in & live:cut & just:play & just:live, Softron OnTheAir, MovieRecorder and OnTheAir CG, Flash Media Encoder, Wirecast, Livestream Procaster, Resolume Avenue 4, Sony Vegas Pro, Corel VideoStudio Pro X4, CyberLink Power Director, MAGIX Video Pro X4, Vidblaster Pro & Studio & Broadcast, Uniplay, Playbox AirBox, CasparCG, Magicsoft CG, Xsplit Broadcaster, Imagine Communications Velocity & InfoCaster. HD Format Support: 720p50, 720p59.94, 720p60, 1080PsF23.98, 1080p23.98, 1080PsF24, 1080p24, 1080PsF25, 1080p25, 1080PsF29.97, 1080p29.97, 1080PsF30, 1080p30, 1080i50, 1080p50, 1080i59.94, 1080p59.94, 1080i60, 1080p60. SDI Compliance: SMPTE 435, SMPTE 259M, SMPTE 292M, SMPTE 372M, ITU-R BT.656 and ITU-R BT.601. SDI Metadata Support: VANC capture and playback using up to 3 lines of video in file. HD RP188. Closed captioning. Audio Sampling: Television standard sample rate of 48 kHz at 24-bit. SDI Color Precision: 8, 10-bit YUV 4:2:2 and 8, 10, 12-bit RGB 4:4:4 in HD, 2K and 4K. Multiple Rate Support: HDMI and SDI video connections are switchable between SD/HD/2K and 4K. Component analog video connections are switchable between SD and HD. HD Down Conversion: Built in, high quality hardware down converter outputs Ultra HD to HD or HD to SD downconverted signal on SDI B and SD on Composite and S-Video. Switch analog video to Component and choose HD or SD output. Selectable between letterbox, anamorphic 16:9 and center cut 4:3 styles. HD Up Conversion: Built in, high quality hardware up conversion from SD to 720HD or 1080HD on playback. Selectable between 4:3 pillarbox, 14:9 zoom and 16:9 zoom. HD outputs via HD-SDI, HDMI and component analog. HD Cross Conversion: Built-in, high quality hardware cross conversion from 720HD to 1080HD, 1080HD to 720HD on playback. Real Time Effects: Final Cut Pro X internal effects. Premiere Pro CC Mercury Playback Engine effects. Avid Media Composer internal effects. DaVinci Resolve. Colorspace Conversion: Hardware based real time on output.